Look! Sunshine! Out there! How lovely! Hope it’s nice where you are. 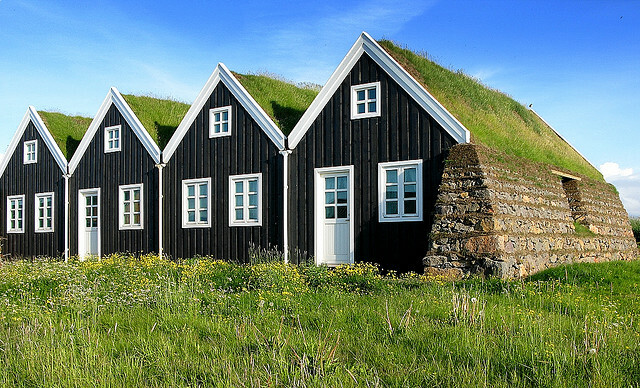 Okay, not real proper big ones – tiny Icelandic turf houses, but instead of using turf I’ve used felt (no surprise there!). The turf provided very good insulation, and also stopped drafts getting in – in fact, it’s making a little bit of a come back as building material these days. They’re made by needle-felting together pieces of thick wool felt sheet, then tiny details (the door and window frames and door handle) are added by needle-felting in merino wool, and the window panes are made with a couple of tiny cotton stitches to the back of the final layer of felt. I’m rather pleased with how they’ve turned out. 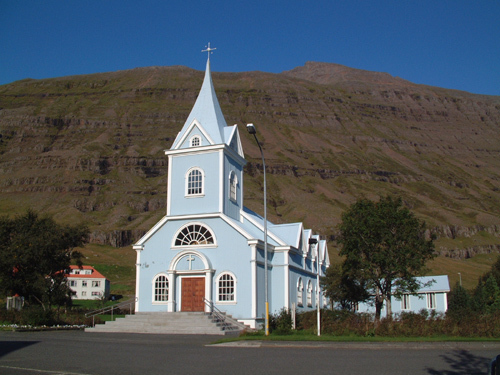 It’s loosely based on this little blue church in the village of Seyðisfjörður in east Iceland, where my father lived. So there you have it! Hope you like my little constructions!